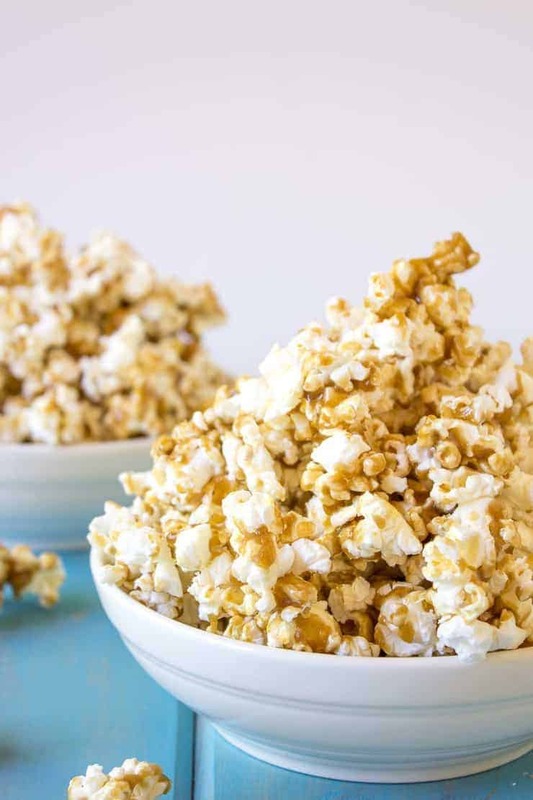 Halloween is almost here and there’s nothing better than creating homemade treats for your little goblins to munch! 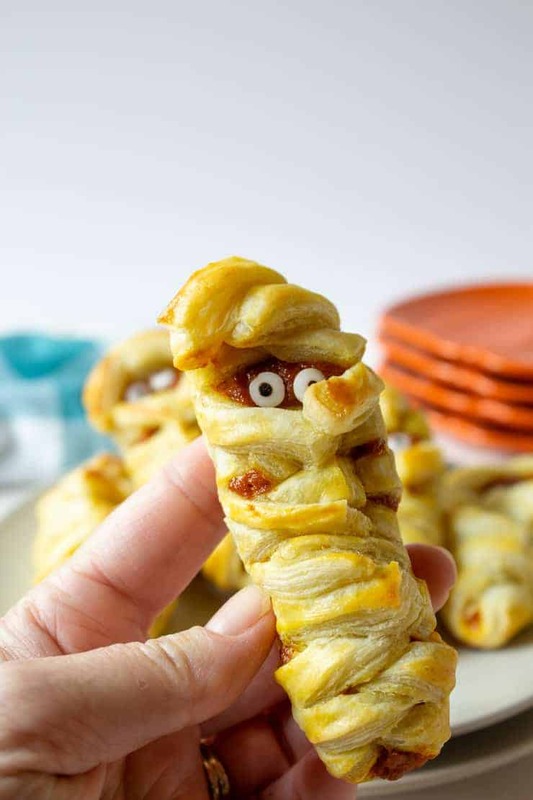 These Mummy Pumpkin Hand Pies are a perfect dessert bite for everyone to gobble up! 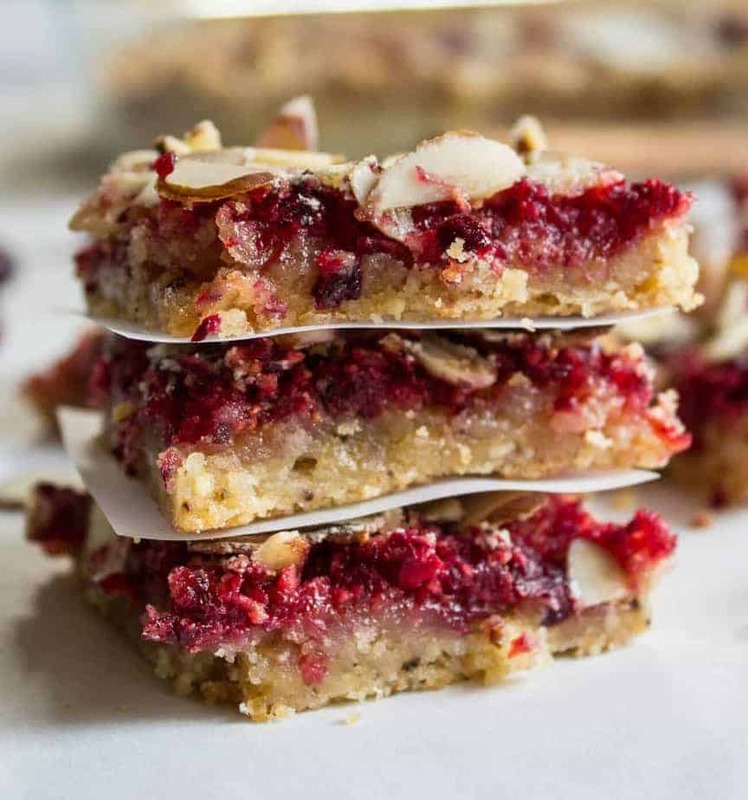 They aren’t too sweet, but are a perfect end to a party meal! 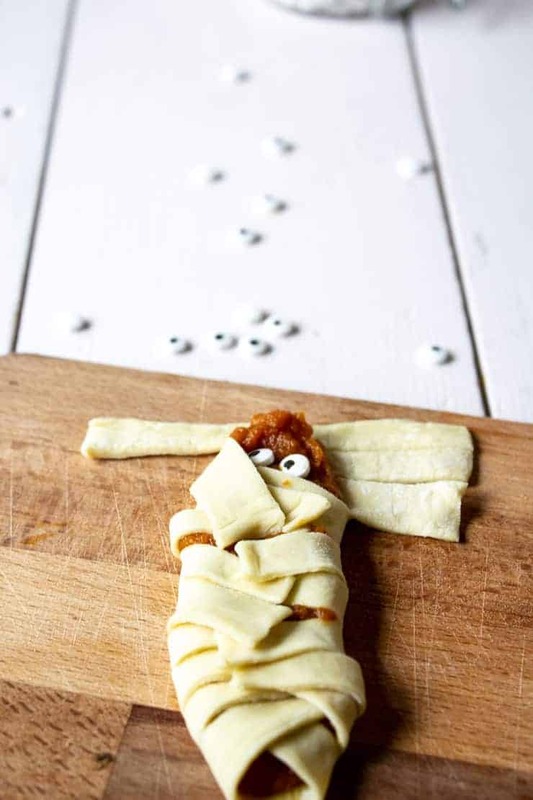 These Mummy Pumpkin Hand Pies are easy to make and are sure to be a hit at your Halloween party! I used store bought puff pastry and whipped up a quick pumpkin filling. 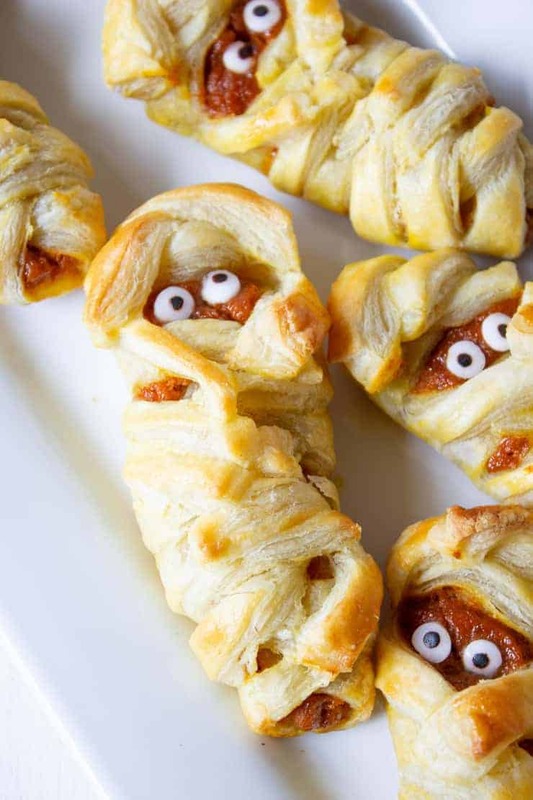 The googly eyes add just the right touch for a friendly mummy look! The hardest part when making these mummies is the folding of the mummy. Actually, it’s not hard, it just takes a few minutes to make each mummy. The key is making small strips and folding them over the filling in a random manner. The candy eyes get tucked in just before folding the last few strips. 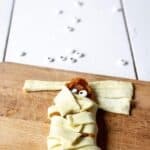 Once each mummy is complete, they get a light egg was coating and then they are popped into the oven until golden brown. These Mummy Pumpkin Hand Pies are delicious eaten warm or at room temperature. Don’t worry if you no longer have little kiddos at home anymore, my three teenagers thought these were a delicious treat! The may act like they are too old for all these cute things, but deep down, they still think they are fun! Do not place too much filling or it will be oozing out all over. Cut strips after you place filling. 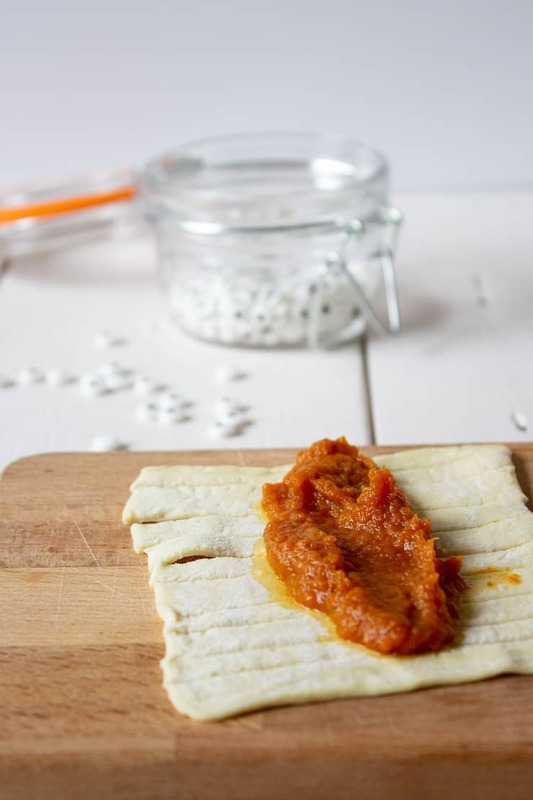 Use egg wash to help secure puff pastry strips. 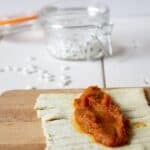 The strips are fine when touching the filling, but when they are layered on top of another strip only, use a bit of egg wash between the strips. 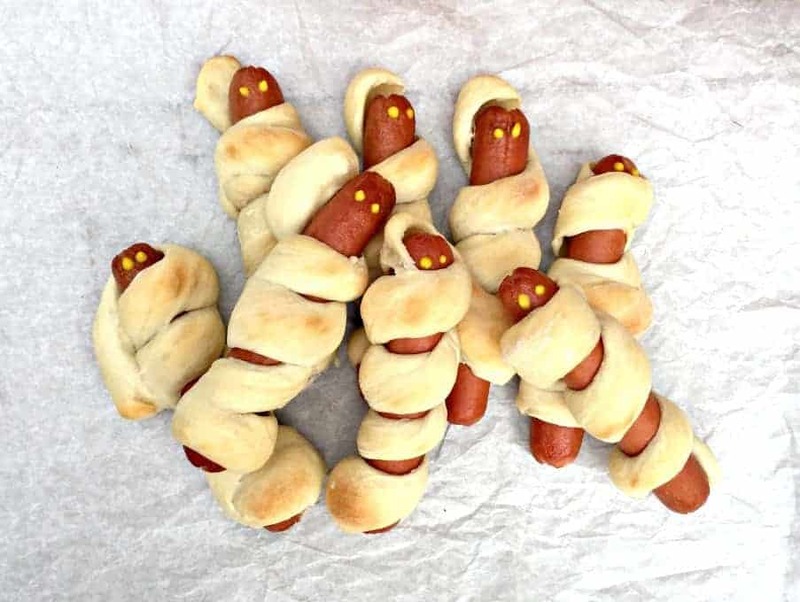 Place mummies on a baking sheet lined with parchment paper to help avoid sticking. Use an egg wash over entire surface before baking. Do not get egg wash on the candy eyes. 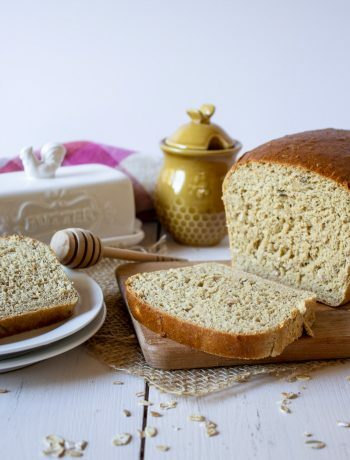 If you wanted your mummies to be a bit sweeter, sprinkle with sugar prior to baking. Mini candy eyeballs can be found in most cake decorating sections of your store. 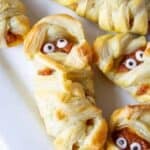 Mini pumpkin hand pies shaped like mummies! Mix all filling ingredients together in a bowl. Set aside. Mix egg wash using one egg and one tablespoon water. Place one sheet of puff pastry on cutting board. Cut into 9 rectangular pieces approximately 3" x 5". Cover cut pieces with a clean towel and set aside. Work with one small rectangle at a time. Place 1 Tablespoon of pie filling in center of rectangle. Spread filling length wise on rectangle. 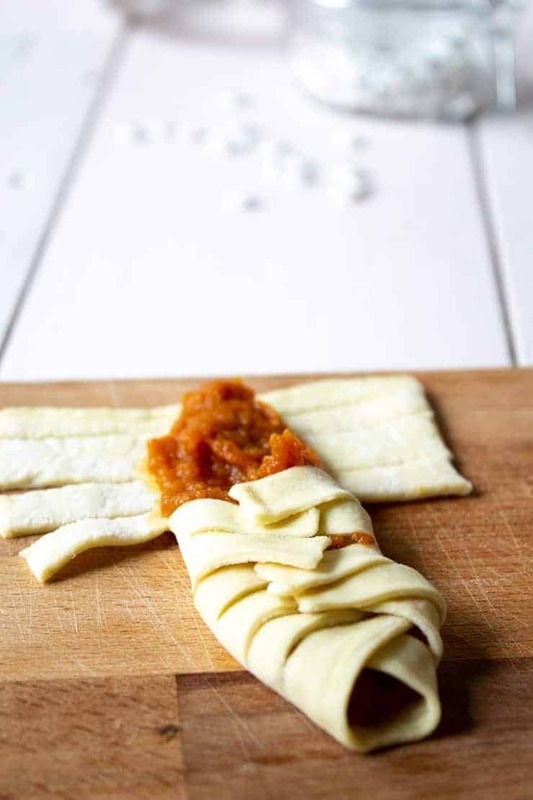 Cut several small slits in puff pastry on either side of filling. Starting at the bottom, fold slits towards middle of filling. Use egg wash to help seal two pieces of puff pastry together. Add two candy eyes on top of pumpkin filling. Finish wrapping mummy, leaving eyes exposed. Bake in a preheated 400 degree oven for 12-15 minutes until golden brown. Cool on a baking rack. Serve warm or at room temperature. A "pinch" is approximately 1/16 of a teaspoon. Oh Kathy, these are so adorable. Very clever. My guys, all ages, will love these. I like that they’re just fall cute, but not scary. Those cute eyes are what keep these mummies so friendly looking! Those pies are adorable! I love it. 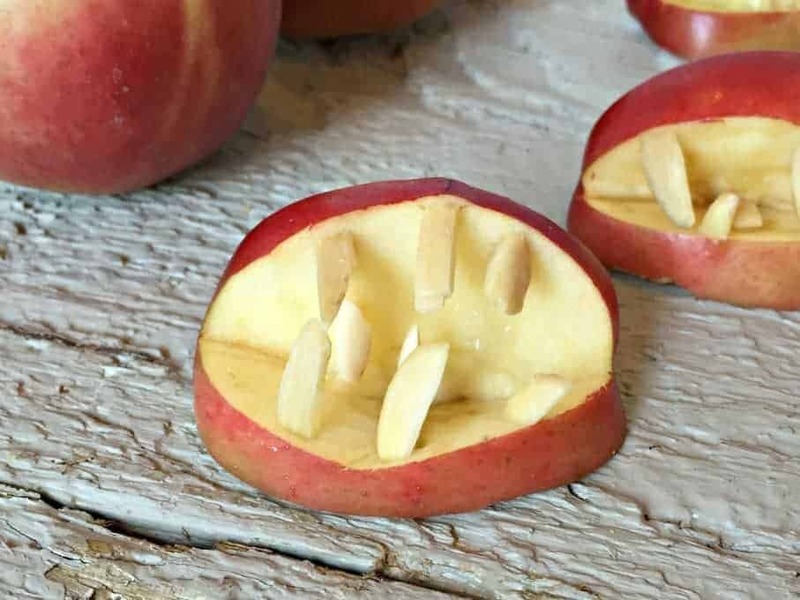 I also LOVE the apple teeth! Too cute to eat, but I would or at least the little boy in me would. I’m sure they’ll be a loved by kids young and old. You are right….they are perfect for everyone – no matter their age! These are so adorable Kathy! So perfect for a Halloween party. I love the pumpkin filling! So adorable, Kathy! What a great idea, kids will love them and grown-ups, too! I know where I’m coming trick-or-treating this year! 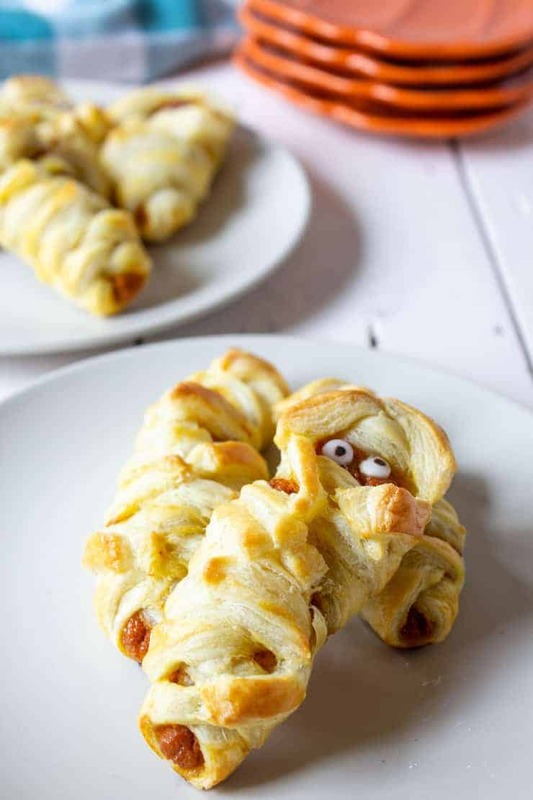 This pumpkin mummy hand pies are so cute! I know Robbie would be all about these. Actually, in true 3-year-old fashion, he would be skeptical at first, but the fact that it has googly eyes would be a game changer in the end. haha! Love this idea, Kathy! OMG – how freakin’ cute are these?! Love how easy they are to whip up too! My niece would love them…and me too, of course 🙂 Totally trying for Halloween. 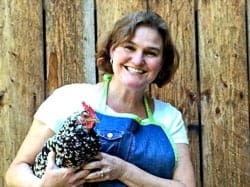 Have a great week, Kathy! There’s no age limit for celebrating Halloween! 🙂 Kids and adults love these fun treats!! !